Easily one of the greatest reggae albums of all time, Soul Rebels resulted from the intensive partnership brokered by the group and maverick producer, Lee 'Scratch' Perry. It was the first Wailers 'concept' album, conceived as a long-player based on a rebellious theme, rather than a collection of isolated singles, and the presence of the Barrett Brothers in the rhythm section pointed the way for greater glories to come. The Wailers first formed as an unruly 5-piece in 1963, with Junior Braithwaite as lead singer and Beverley Kelso an early member, sometimes replaced by Cherry Green. During their long tenure at Studio One, Bob Marley gradually shifted to the lead vocal role and the robust core of Marley, Peter Tosh and Neville Livingston, aka Bunny Wailer, soon emerged as the mainstays of the group. 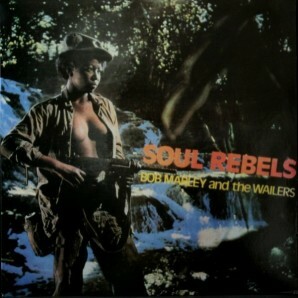 Perry was involved with the Wailers at Studio One, using their talents for backing vocals on some of his solo work, but the partnership that yielded Soul Rebels was in an entirely different league. The title track, Tosh's anguished '400 Years and 'Corner Stone' are legendary for their intense power; 'It's Alright' set the template for the later 'Night Shift,' 'My Cup' was an individual barebones reading of James Brown's 'I Guess I'll Have To Cry Cry Cry,' while the playful 'Try Me' and 'No Water' are suggestive odes. Tosh's dejected 'No Sympathy' and the spirited 'Soul Almighty' are other winners and the 'Cloud 9' revamp 'Rebel's Hop' is another joy. All killer, no filler!